Native to western Asia and to Europe. Introduced and naturalized in North America. Dry. Roadsides, disturbed sites. Full sun. This is a 1′ to 3′ tall, erect, biennial forb that rises on one or more stems from a fleshy taproot. In its first year it shows only a rosette of basal leaves. 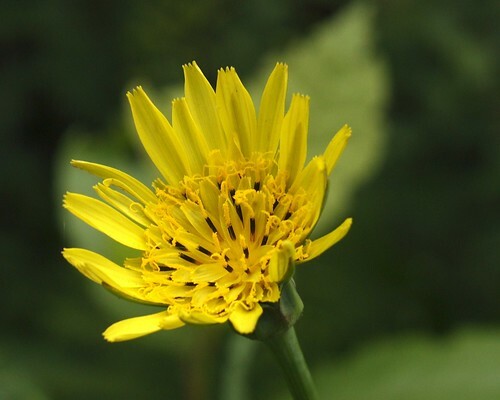 In the second year it sends up one or more sparingly branched, sparsely-leaved stems that terminate in a single flowering stalk with a solitary flower head. 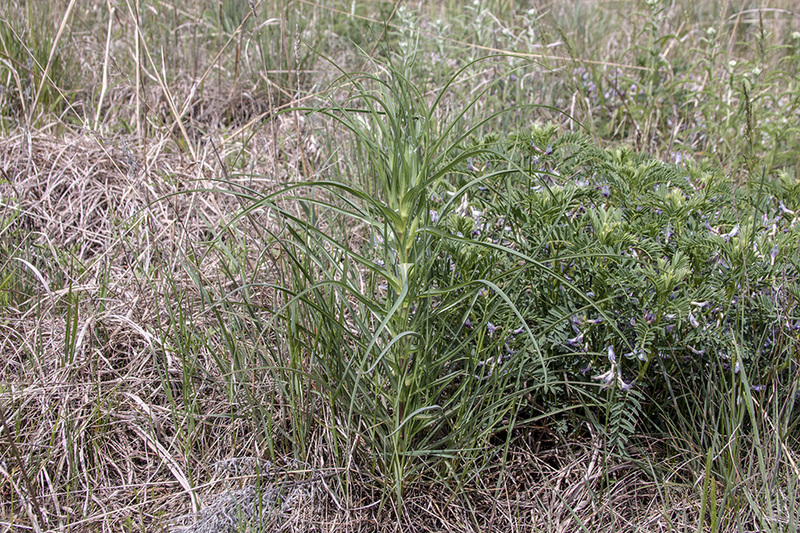 The stems and leaves are grayish-green or bluish-green and exude a milky sap when broken. 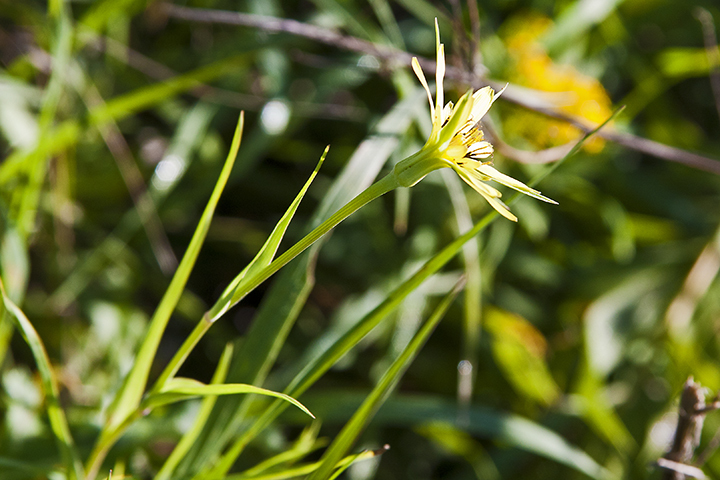 The grass-like leaves are alternate, clasping, untoothed, and between linear and lanceolate in shape. They get up to 12″ long and ¾″ wide, though most are closer to ¼″ wide. They taper evenly from the base to the tip. They do not bend backward, even at the tip. Young leaves have tufts of long, soft, tangled hairs. Older leaves become almost hairless except at the leaf axils. The leaf surface is fine, not rough. 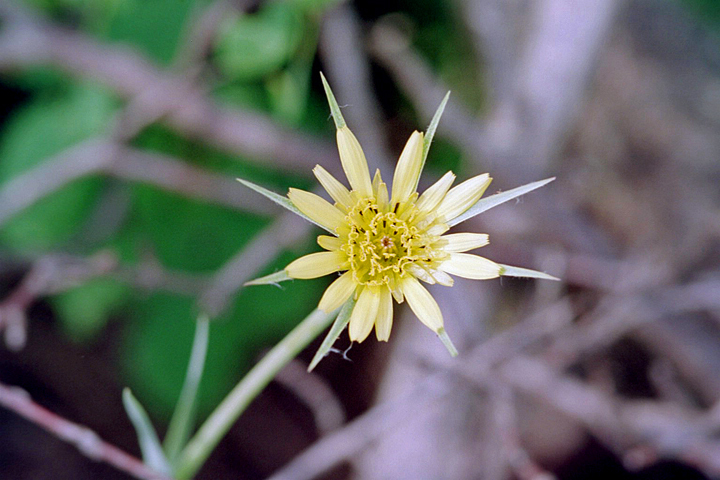 The inflorescence is a solitary flower head, 1½″ to 2″ wide, at the end on a long, leafless flower stalk. 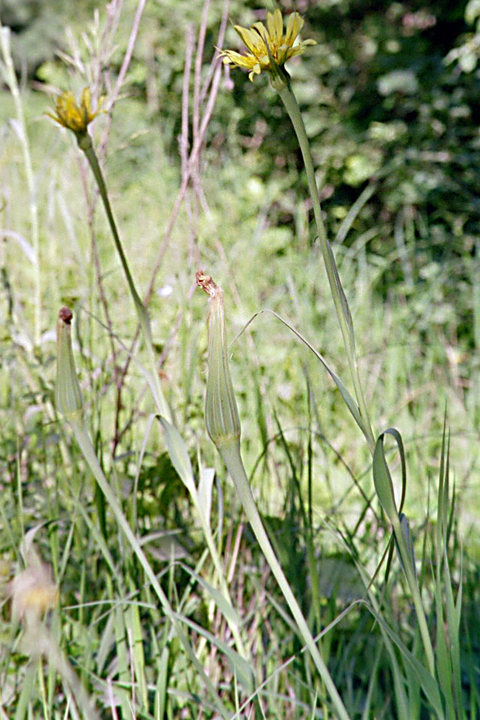 The flower stalk is hollow and is swollen just below the flower head. 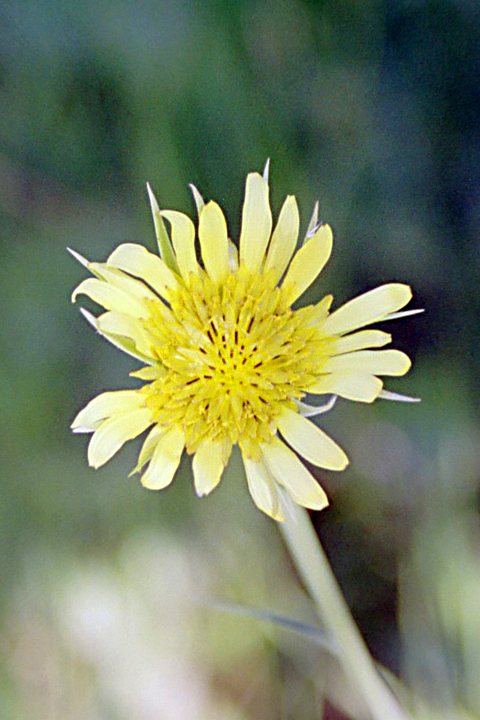 The flower head has many pale yellow outer ray florets about 1″ long. 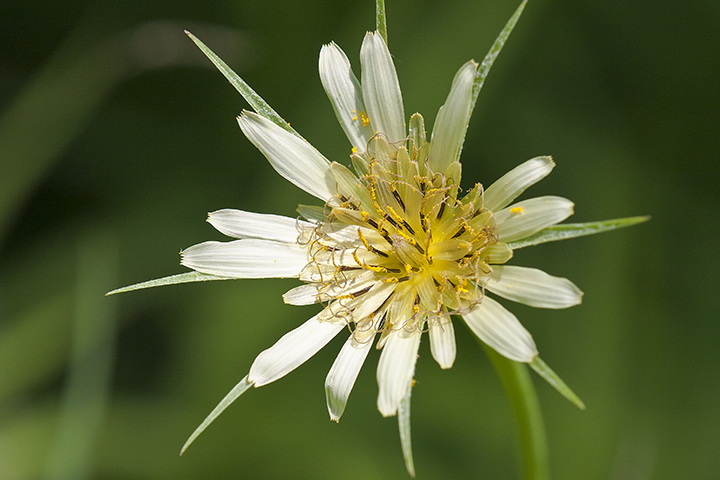 There are 13 bracts at the base of the flower head that extend well beyond the outer margin of the rays. There may be only 8 bracts on smaller plants and on later heads. The flower heads open in the morning and are closed by the afternoon. 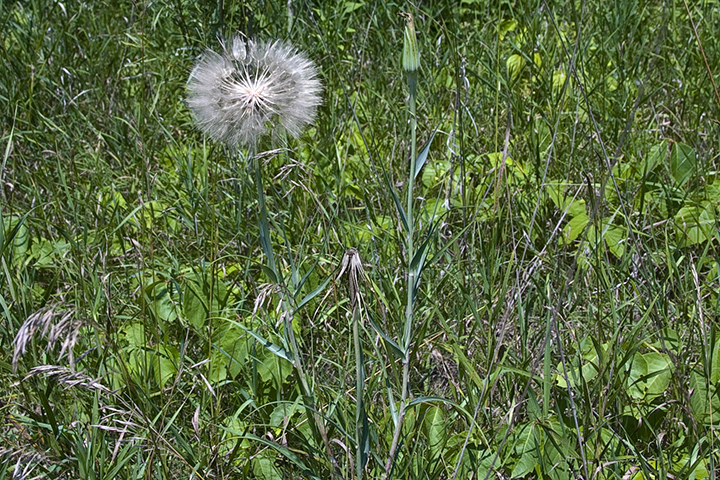 The fruiting head is a whitish, spherical pappus, about 3″ in diameter, resembling a large dandelion. 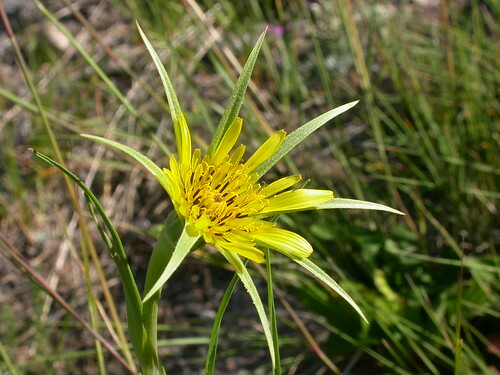 Meadow salsify (Tragopogon pratensis) leaves are curved backward or coiled. 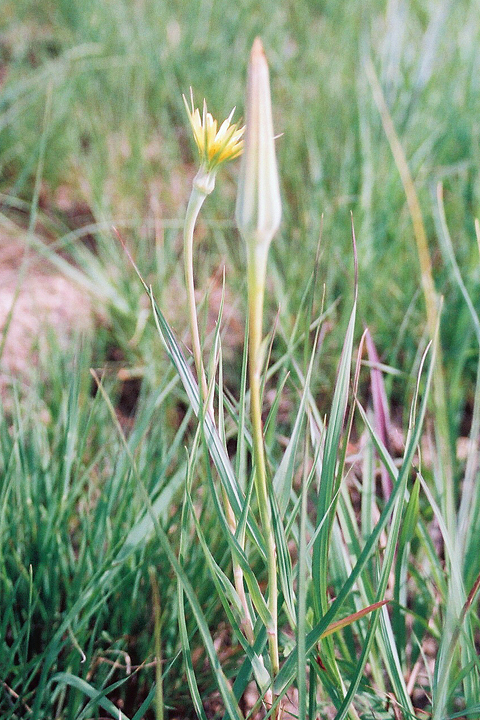 The peduncle is not inflated at the tip when the plant is in flower. There are usually 8, occasionally 12, bracts. 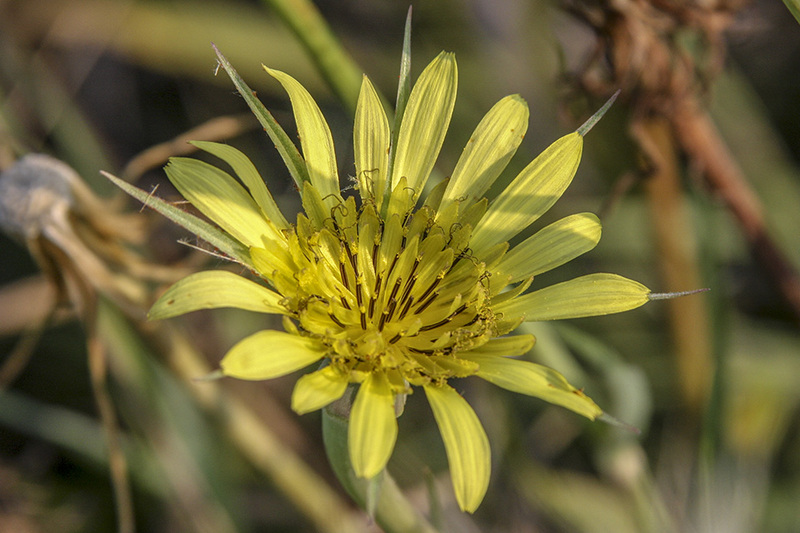 The bracts do not extend beyond the ray florets. 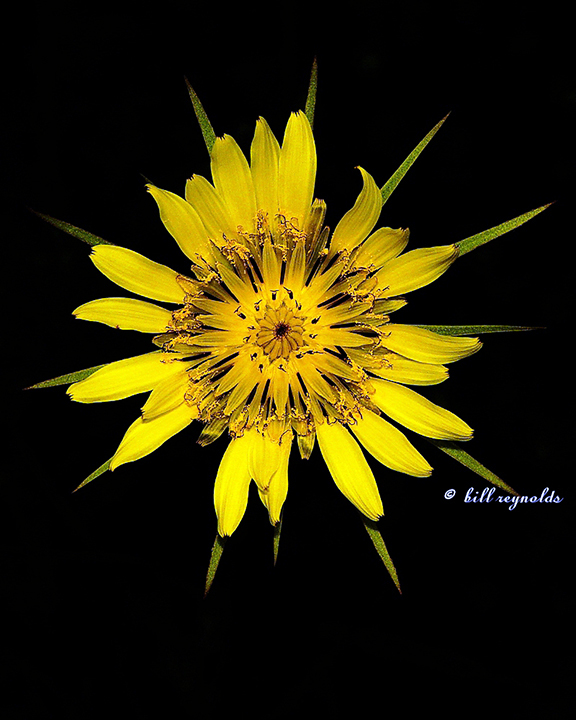 The ray florets are lemon yellow or bright yellow. It is found in moister habitats. Distribution Sources: 2, 3, 4, 5, 7, 22, 28. 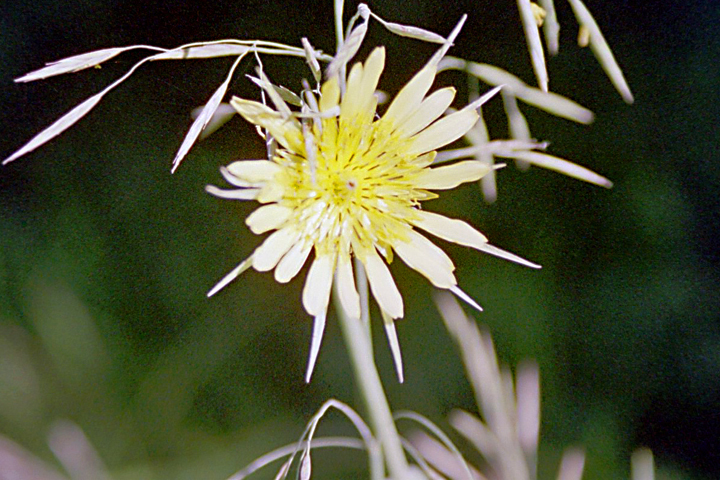 The modified calyx composed of awns, scales, bristles, or feather-like hairs in plants of the Aster family such as thistles and dandelions. 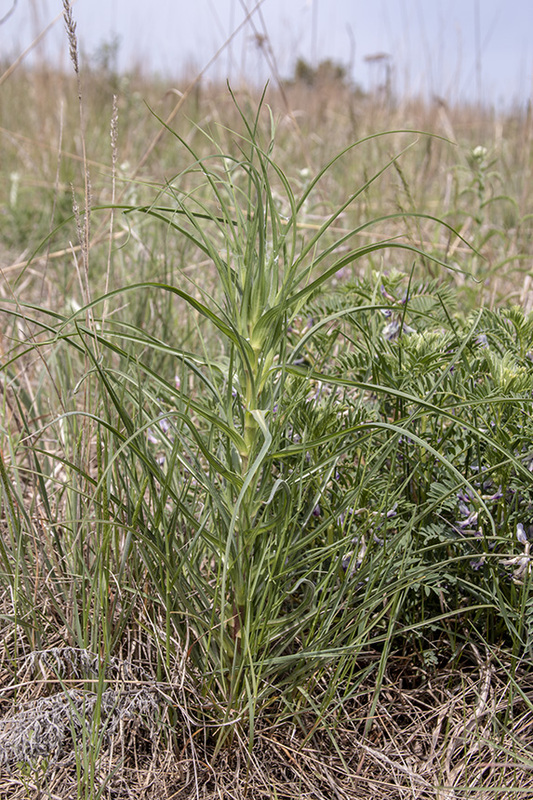 Introduced taprooted biennial to short-lived perennial, stems to 1 m tall and bearing entire leaves, involucral bracts in one equal series, peduncle swollen, rays yellow, pappus of capillary bristles, common in grasslands, meadows, and sagebrush steppe, typically sites with a history of disturbance. The leaves in the first year leafy rosette can be mistaken from grass except that the tips can be readily plucked off to expose the milky sap. MNEMONIC NOTE: This plant is 1 of 3 in this course that have the word "lion" in the nickname (Lion's Paw, Dead-The-Lion, Lion's Boat). 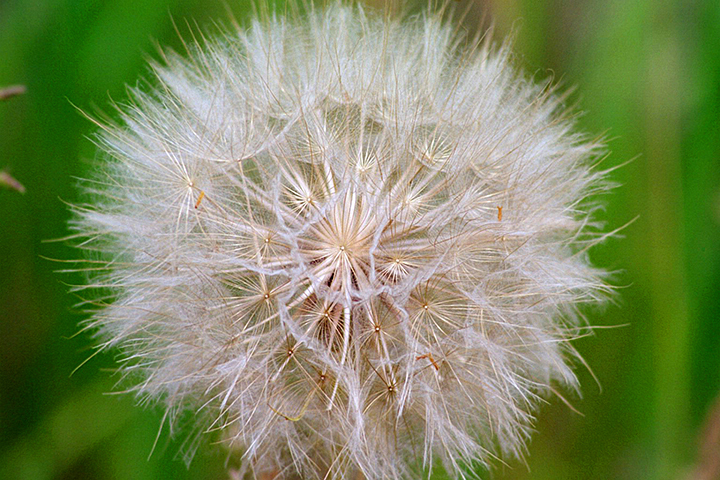 All 3 resemble or is the Dandelion and are distinguished, from one another, by their leaves. The leaves are then the springboard to their perspective mnemonics. So... What's the first thing to do when you see a lion in the area? Leave (leaf)! That means: When you see a lion immediately look at the leaves. PRE-MNEMONIC: When you see a lion in the field immediately leave the area. 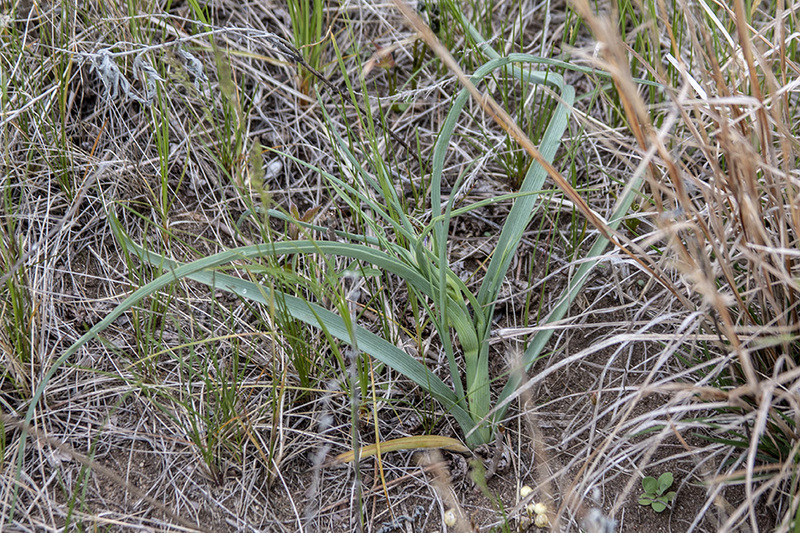 Leaves that look like grass (associated with cows) lets you know that you might have the Lion's Boat plant. MNEMONIC EXPLAINED: A cow (associated with grass [plant leaves are grass-like] and milk [exudes a milk sap when broken]) and a rabbit (associated with carrots [roots are stout and tapered; carrot-like; beige not orange; grass-like leaves also grow out of root top (carrot top-ish); grass-like leaves partially encircle developing stem and flowering stem at their base] and big ears [represent bracts that extend beyond flowerhead margin/edge/radius like ears extend beyond rabbit's head]) wanted to go across water for greener pastures. They accepted a ride from a lion (flowerheads and puff-ball seedheads resemble dandi-LION but are much larger) who offered to transport them, on his boat (leaf tips are keeled [bottom of boat]), with a promise of not eating them. During the journey, like in a cartoon, when the lion looked at the cow he saw a glass of milk and when he looked at the rabbit he saw a chocolate bunny (lion, cow and rabbit are closely tied or associated in this sentence in a way that by thinking of one will remind you of the others; important because leaves and roots are best [though edible] before flowering stem has developed; find just grass-like leaves in the field, easily associate them with a cow, cow is tied to milk that is tied to chocolate that is tied to rabbit/bunny; both cow and rabbit is tied to the lion [in case you see the lion in the field first]. Unable to resist himself he started chasing them around and around. All of the running around in circles triggered a whirlpool. The lion caught them and swallowed the chocolate and the milk. The whirlpool swallowed the lion (the stem becomes enlarged and hollow underneath flowerhead; enlarge, hollow stem represents the whirlpool and the flowerhead represents the lion). OPTION 1: As you vividly imagine the lion being swallowed by the whirlpool, notice all of the blood on his tan fur appears purple (1 of 2 look-alikes have purple flowers [they also may not have bracts/ears that extend as far beyond the flowerhead]; look-alikes can be used identically) not red. OPTION 2: Vividly imagine the lion consuming the chocolate bunny as we all did/do, by biting the ears off first (2 of 2 look-alikes don't have bracts/ears that extend far beyond flower margin; look-alike bracts will be slightly shorter, slightly longer or even with flower margin). NOTE: Both look-alikes can be used/prepared/eaten as Lion's Boat. Dispersal of seeds away from the parental plant is very important for diffusion and plants invest resources in a variety of structures specialized for this task. Wind dispersal is a particularly common strategy; many species rely on winged or plumed seeds to increase the efficiency of dispersal. 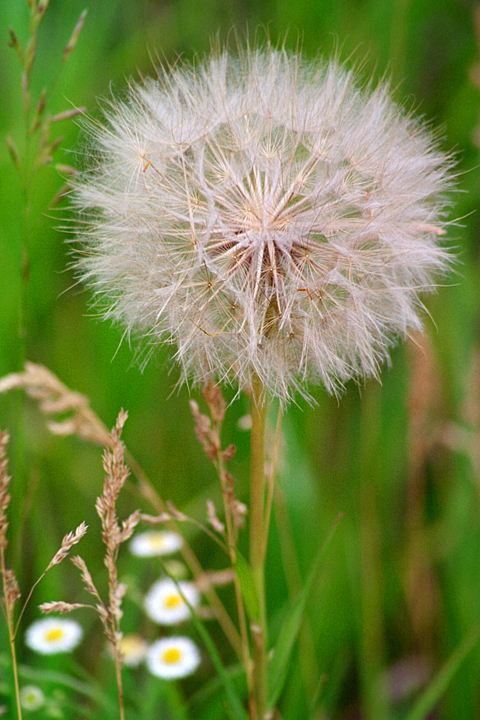 The dispersal distance of a wind-dispersed seed is influenced by wind speed, the height at which the fruit is released, and the rate at which the seed falls to the ground. For this reason many plants evolved structures which decrease the terminal velocity of their seeds so that seeds can be spread out further. 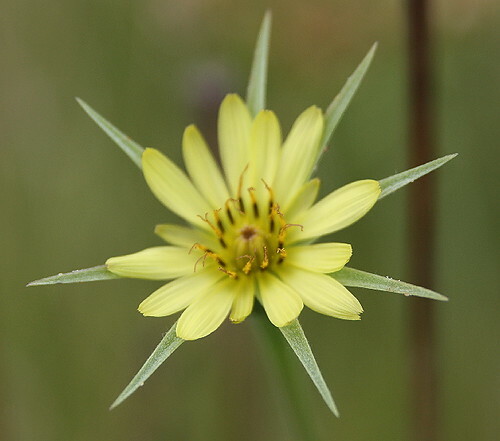 Yellow Salsify (Tragopogon dubius), a member of the sunflower family, is an introduced species to North America, originating in Central Europe and Western Asia. 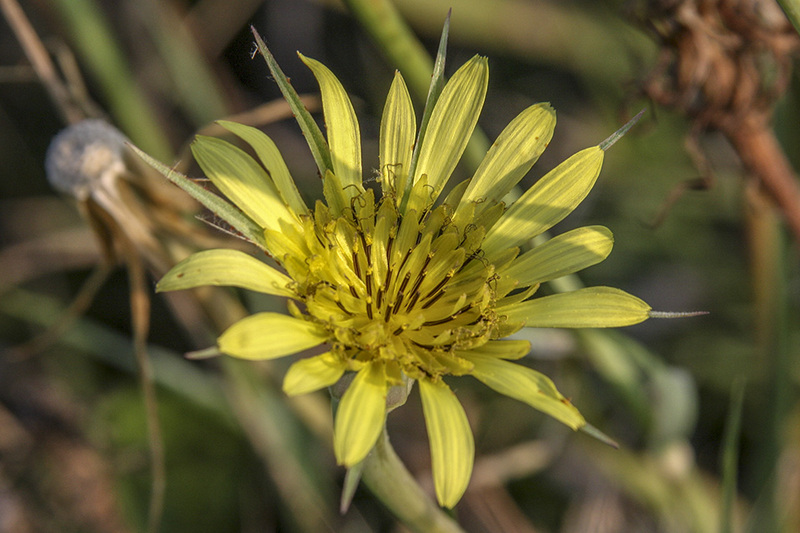 It goes by wide variety of other names including western salsify, western goat's-beard, wild oysterplant, yellow goat's beard, goat's beard, goatsbeard, common salsify, and salsify. It now grows throughout the majority of the United States and Canada.